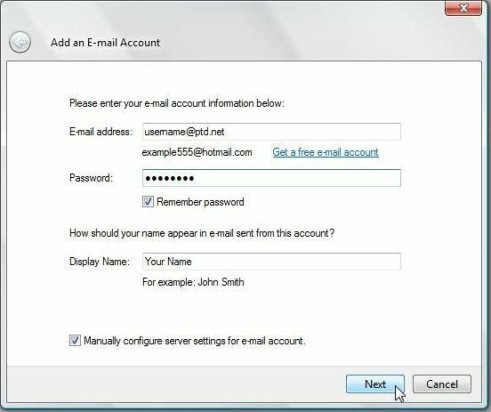 The following information will provide you with the software settings needed to configure/setup your email software to access your PenTeleData email via IMAP. It is strongly recommended to access your email either by My PenTeleData Webmail or configuring your email client to access your email using an IMAP connection. 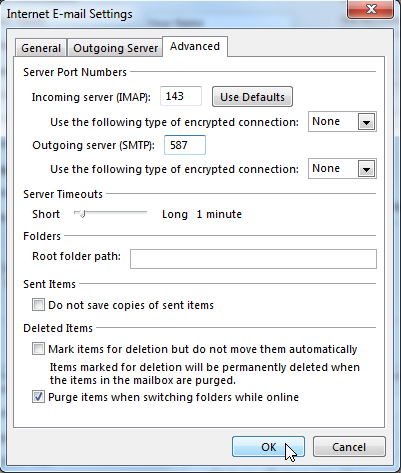 Use of POP3 may result in messages remaining on the server instead of downloading to your email software. 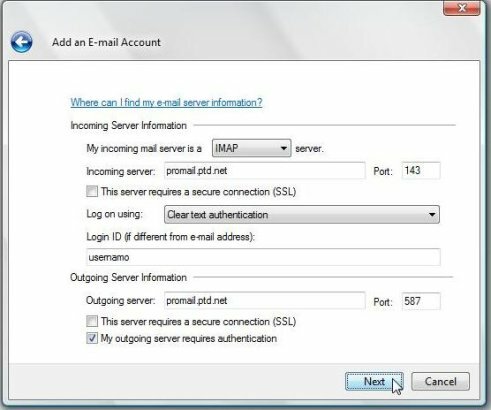 These detailed instructions will guide you on how to configure you e-mail software to use the PenTeleData Promail Server with an IMAP connection. 1. Open Microsoft Outlook by either selecting the “Microsoft Outlook” icon from the Windows “Desktop” or by selecting the “Microsoft Outlook” icon from the “Windows” menu. 2. Select “Add Account” from the “File” menu. 5. In the box labeled "Your Name:", enter your name as you would like it to appear when people receive e-mail from you. 6. In the box labeled “Email Address:”, enter your PenTeleData email address in all lower case letters. 7. In the box labeled “Account Type:”, choose “IMAP” from the drop down box. 8. 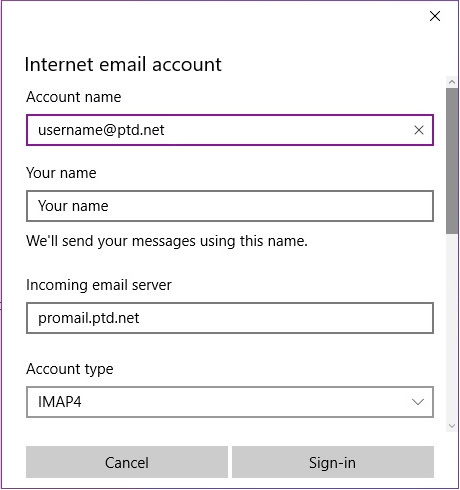 In the box labeled “Incoming mail server:”, enter “promail.ptd.net” in all lower case letters. 9. 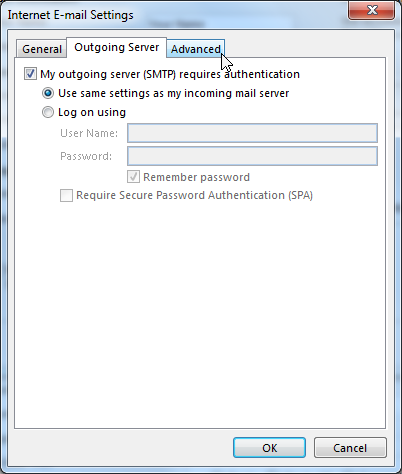 In the box labeled “Outgoing mail server (SMTP):”, enter “promail.ptd.net” in all lower case letters. 10. In the box labeled “User Name:” your email address will automatically appear after entering it into the “Email Address” field. Remove the “@ptd.net” from it. 13. Click on the “Outgoing Server” tab on the top of this window. 14. Place a “check” next to “My outgoing server (SMTP) requires authentication,” by clicking your mouse over the box one time with the left mouse button. Then click on the “Advanced” tab. 16. You will now be returned to the “Add Account” window, click “Next” to continue. 17. 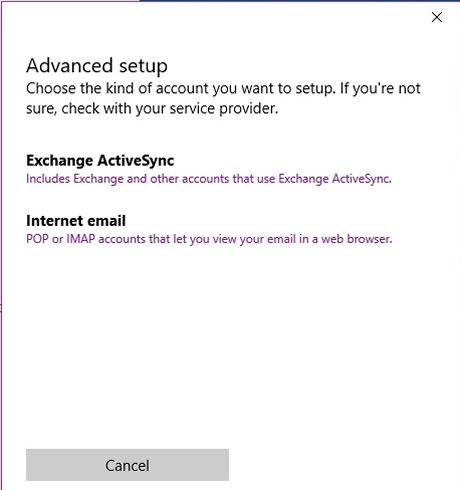 Microsoft Outlook will automatically test the account settings. If both tests complete successfully, click “Close.” If there are any errors encountered, go back to step 12 and recheck your settings. 18. The “Add Account” wizard has now been completed. Click “Finish” to close the wizard. Open Windows 10 Mail App by either selecting the “Mail” tile or by choosing from the “All Apps” shortcut from the “Start” menu (Known as the “Windows menu). 1. To add an e-mail account, choose the “Gear” symbol in the lower left of the Mail Application. 4. In the box labeled “Account name:,” enter your PenTeleData e-mail address. 5. In the box labeled “Your name,:” enter your name as you would like it to appear when people receive e-mail from you. 6. In the box labeled “Incoming email server:,” enter “promail.ptd.net” in all lower case letters. 7. 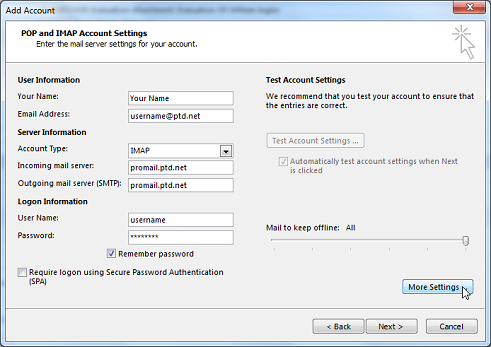 Under “Account type,” select “IMAP4.” Continue by scrolling down in the "Internet email account" window. 8. Still within the “Internet email account” window, in the box labeled “User name,:” enter the first portion of your PenTeleData account name, or the entire e-mail address. 9. In the box labeled "Password:", enter the password that corresponds to your "User Name" entered above. When typing your password, only a series of " • • • • " will appear for password confidentiality. 10. 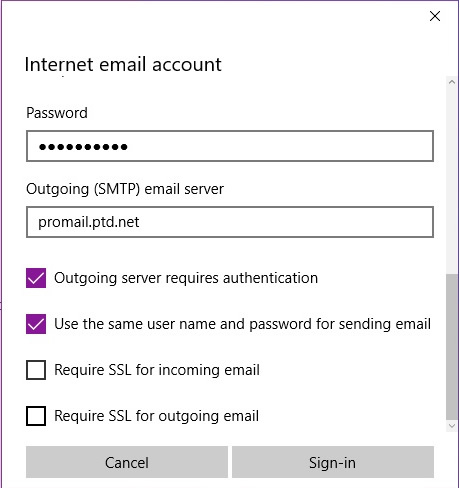 In the box labeled “Outgoing (SMTP) email server:,” enter “promail.ptd.net” in all lower case letters. 11. Place a check in the box next to “Outgoing server requires authentication” and again in the section, “Use the same user name and password for sending email.” Continue by scrolling down in the "Internet email account" window. 12. Uncheck the following options, “Require SSL for incoming email” and “Require SSL for outgoing email. 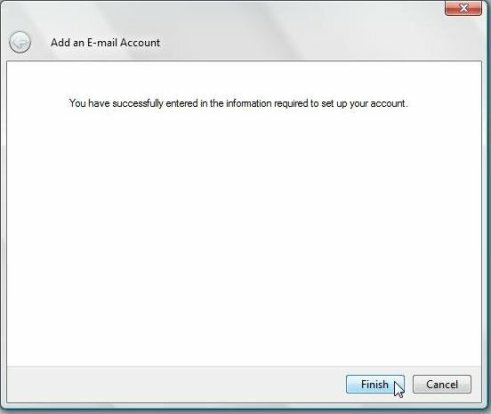 Please note, if you already have an existing POP3 account created, please do not remove the account as this will cause all dated email to be permanently deleted. Open Windows Live Mail by either selecting the “Windows Live Mail” icon from the Windows “Desktop” or by selecting the “Windows Live Mail” icon from the “Start” menu (known as the “Windows” menu in Vista and Windows 7). If the wizard does not appear, your email program may already be configured to send and receive email, please contact Technical Support at (800) 281-3564. The “Add an email Account” wizard will now open. In the box labeled “email address:”, enter your PenTeleData email address. In the box labeled "Password:", enter the password that corresponds to your "User Name" entered above. When typing your password, only a series of "***" will appear for password confidentiality. In the box labeled "Display Name:", enter your name as you would like it to appear when people receive email from you. 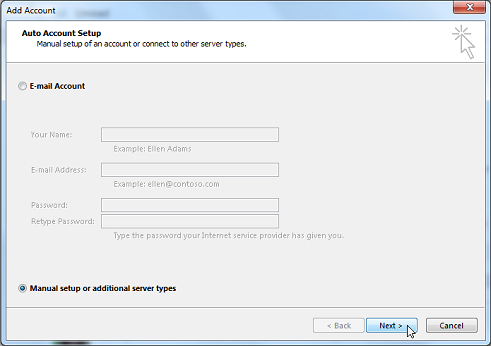 Place a check in the box next to “Manually configure server settings for email account” and click “Next”. In the box labeled “Incoming server:”, enter “promail.ptd.net” in all lower case letters. 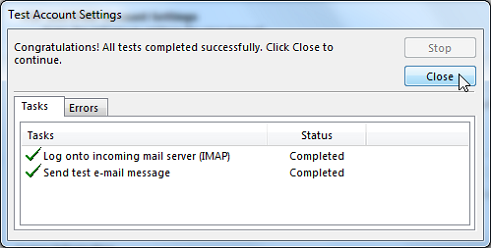 In the box labeled “Outgoing server:”, enter “promail.ptd.net” in all lower case letters. Type “587” in the box labeled “Port” under the “Outgoing Server Information” heading. Place a check in the box next to “My outgoing server requires authentication” and click “Next”. If the wizard does not appear, your e-mail program may already be configured to send and receive e-mail, please contact Technical Support at (800) 281 -3564. 2. The “Add an E-mail Account” wizard will now open. 3. In the box labeled “E-mail address:,” enter your PenTeleData e-mail address. 5. In the box labeled "Display Name:," enter your name as you would like it to appear when people receive e-mail from you. 9. Type “587” in the box labeled “Port” under the “Outgoing Server Information” heading. 1. Begin by opening up Outlook 2011. Once the program is open the “Add an Account” wizard will open. Click “email Account” to continue. 2. 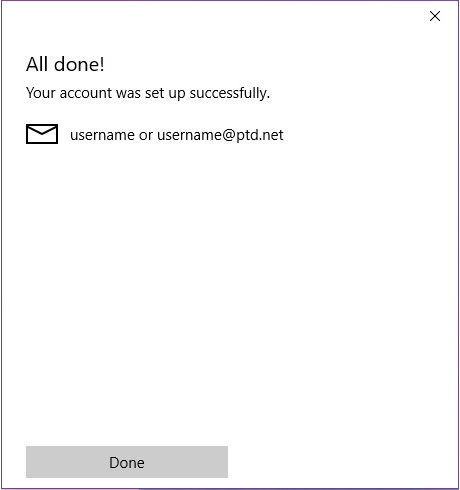 In the box labeled “email address:", enter your username followed by “@ptd.net” in all lower case. 3. In the box labeled “Password:", enter the password that corresponds to you username. When typing your password only a series of “***” will appear for the password confidentiality. 5. From the “Type:” drop down box select "IMAP". 6. In the box labeled "Incoming server:", enter “promail.ptd.net” in all lower case. 7. In the box labeled "Outgoing server:", enter “promail.ptd.net” in all lower case. 8. Place a check in the box next to "Override default port" and change the port to "587". 9. When your screen resembles the window below, click "Add Account". 11. From the "Authentication:" drop down box select "User Name and Password". 12. In the box labeled "User name:", enter the beginning part of your PenTeleData email address. This is everything before the "@ptd.net". 13. In the box labeled "Password:", enter the password that corresponds to you username. When typing your password only a series of “***” will appear for the password confidentiality. 14. When your screen resembles the window below click "OK". 15. You will now be returned to the “Accounts” screen. Click on the close button. 1. Open Mail by clicking the “Mail” icon in the “Dock” or by selecting "Applications” from the “Go” menu at the top. 2. In the box labeled “Full Name:", enter your name as you would like it to appear when people receive email from you. 3. In the box labeled “Email Address:", enter your username followed by “@ptd.net” in all lower case letters. 4. In the box labeled “Password:", enter the password that corresponds to your username entered above. When your window resembles the one shown below, click the “Continue” button at the bottom. 5. 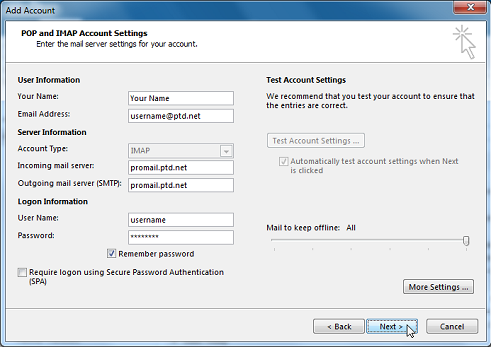 In the box labeled “Account Type:", select “IMAP". 6. In the box labeled “Description:", type Your Name. 7. In the box labeled “Incoming Mail Server:", enter “promail.ptd.net” in all lower case letters, without the quotation marks. 9. In the box labeled “User Name:", enter the beginning part of your email address. This is everything before the “@ptd.net”. 10. In the box labeled “Password:", enter the password that corresponds to your “User Name” entered above. When typing your password, only a series of dots will appear for password confidentiality, click “Continue". 11. If you would like to enable SSL place a check in the box next to “Use Secure Sockets Layer (SSL)", click the “Continue” button to continue. NOTE: For those security conscious customers or customers normally accessing e-mail over wireless connections (Secure or non-secure), please place a check mark in “Use Secure Sockets Layer (SSL). 12. In the box labeled "Outgoing Mail Server:", enter “promail.ptd.net” in all lower case letters, without the quotation marks. 13. Place a check mark in the boxes next to "Use only this server" and "Use Authentication". 14. Enter your username in the field labeled "User Name:", this is everything before the "@ptd.net". 15. Enter your password in the "Password:" field and click "Continue". 16. If you would like to enable SSL place a check in the box next to "Use Secure Sockets Layer (SSL)", click the “Continue” button to continue. 17. On the "Account Summary" window verify all the settings are correct. If any settings are incorrect, click "Go Back", otherwise click "Create". Open Microsoft Outlook by either selecting the “Microsoft Outlook” icon from the Windows “Desktop” or by selecting the “Microsoft Outlook” icon from the “Start” menu (known as the “Windows” menu in Vista). 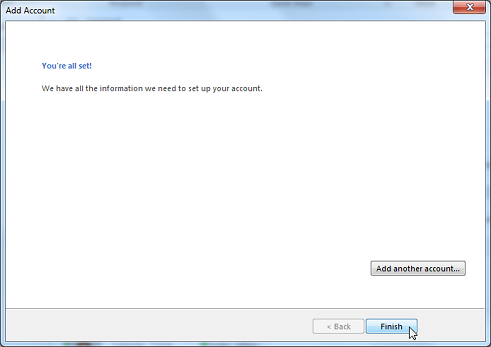 Select “Account Settings…” from the “Tools” menu. 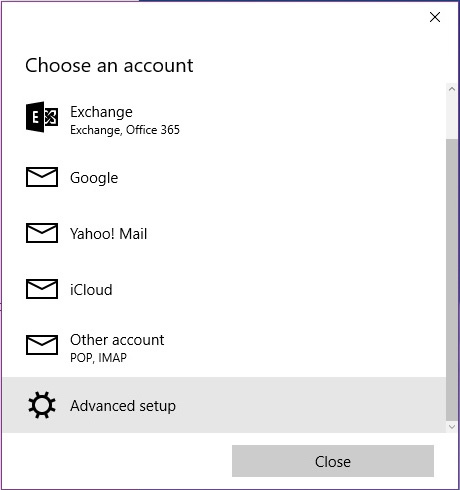 The Microsoft Outlook “Account Settings” window will now appear. Click on the “New…” button. Place a “check” in the box next to “Manually configure server settings or additional server types” and click “Next”. Place a dot next to “Internet email” and click “Next”. In the box labeled "Your Name:", enter your name as you would like it to appear when people receive email from you. In the box labeled “email Address:”, enter your username followed by “@ptd.net” in all lower case letters. 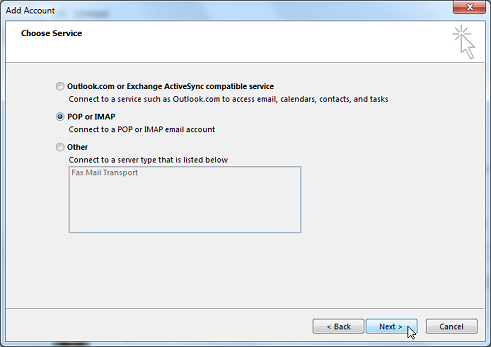 In the box labeled “Account Type:", choose “IMAP” from the drop down box. In the box labeled “Incoming mail server:", enter “promail.ptd.net” in all lower case letters. 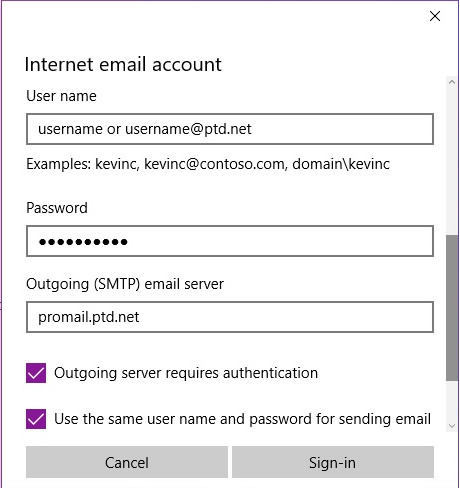 In the box labeled “Outgoing mail server (SMTP):", enter “promail.ptd.net” in all lower case letters. In the box labeled “User Name:", enter the beginning part of your PenTeleData email address. This is everything before the “@ptd.net”. When your screen resembles the window below, click on the "More Settings…" button. Click on the “Outgoing Server” tab on the top of this window. Place a “check” next to “My outgoing server (SMTP) requires authentication,” by clicking your mouse over the box one time with the left mouse button. Then click on the “Advanced” tab. In the box labeled “Outgoing server (SMTP):” type “587”. When you are finished click “OK”. You will now be returned to the “Add New email Account” window, click “Next” to continue. The “Add New email Account” wizard has now been completed. Click “Finish” to close the wizard. You will now be returned to the “Account Settings” window, click on the “Close” button.